I noticed the other day that I’ve done 1,680 miles on my e-bike, according to my odometer, and while that isn’t a special number at all, it struck me that it was a big number, so I thought I’d share some experiences to help anyone thinking of investing in one. It’s like gravity is turned off! 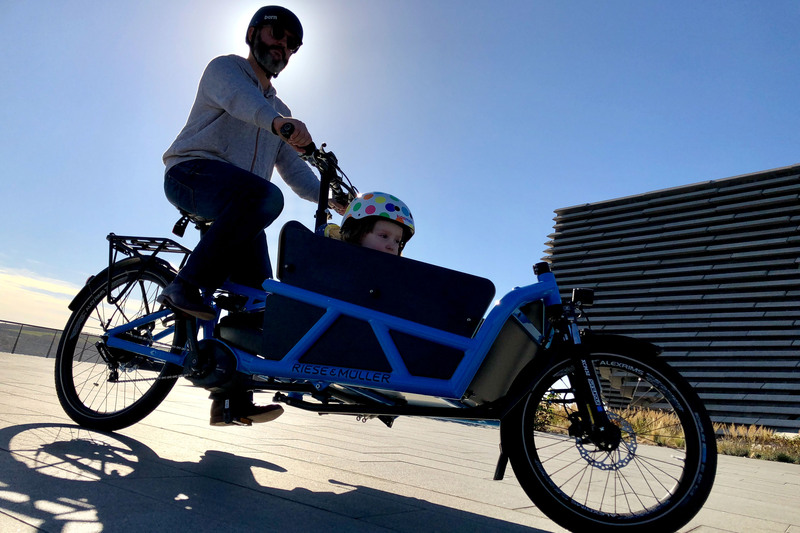 When you use a pedal-assist electric bike, which amplifies your leg-power, it feels like gravity has been dialled down. You start pushing, the motor kicks in, and then wheeee! It’s fun, and it still makes me smile after many months of riding. 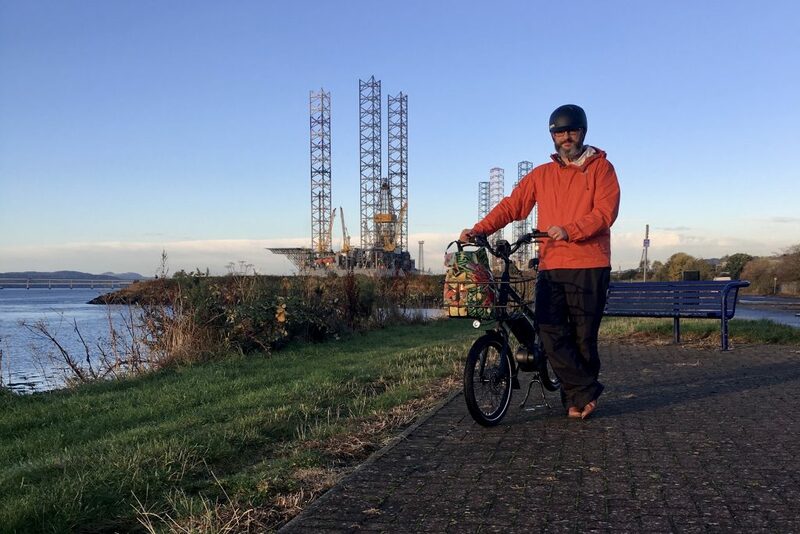 In the first couple of weeks of having my e-bike, I was constantly shifting through the five different acceleration modes, but I quickly realised I was happy to leave it permanently set to Turbo. That’s because, due to the law, the electric boost fades out towards 17mph, so I just use the maximum assist to get me going from a standing start, and then once I’m rolling at a comfortable cruising speed, the electric assist fades, and I’m just cycling with muscle power. I used to try to commute on a push-bike, but it was too easy to fall back on other options; the need to shower and change at work just added too much friction to my day. But with the e-bike? I cycle every day. Because it’s classed as a bike, you can go pretty much anywhere. You can ride straight up to the door of shops, rather than parking somewhere and walking to where you need to be. It’s so easy to nip to the shops for a pint of milk. Electric bikes – like electric cars – are expensive to buy, but they cost pence to run. Literal pence; I charge my battery about twice a week these days, and depending on your tariff and the battery capacity of the bike you buy, that could be somewhere between 5 and 15p for each charge. I’ve been riding my electric bike long enough to have recently started to notice that the battery isn’t holding as much charge as it used to, just as how any other common battery technology in laptops and phones would start to degrade over time. I still get more than 30 miles per charge (and remember, that’s me leaving the electric assist on full), and batteries’ performance drops in the kind of cold weather we’re having as I write this, but it’s prompting me to look at the cost of replacement batteries, and they ain’t cheap. I just have to remember all the money I haven’t spent on petrol and parking, and at least, unlike most phones and laptops, replacing the battery is easy. I doubt it will be a problem that needs to be addressed until I’ve done at least another thousand miles anyway. Cycling infrastructure is getting better every day, and all the benefits I’ve talked about here apply wherever I’m riding. This is why I’ve used it, for example, even for meetings in London. I’m not saying I rode all the way from Dundee, but I cycled to the station, loaded my bike onto the sleeper train, and then once I arrived into Euston, I showered, breakfasted, and used my handlebar-mounted phone to plot a cycle-friendly route to exactly where my 10am meeting was. After that, cycle back to the station, then load me and the bike back onto another train, and back up to Dundee, enjoying lunch on the way. All throughout, I was fast, direct and not held up in rush hour traffic or jostled on public transport, and, because my bike is electric, I didn’t break a sweat. Cycling, even on an electric bike, of course has physical health benefits, but it has a hugely positive effect on my mental health as well. I so look forward to riding the lovely cycle path that heads north-east up the coast from Dundee, and that I have a chance to switch from and to work and home mode on my commute, as I watch the light and weather play over the river. For me, my e-bike is just a tool. I’m not really a recreational cyclist, though I have done a few leisure cycles. That 1,680 miles is mostly my 4-mile-each-way commute into the city centre. But it’s a tool I love, and one I look forward to using every day; the next 1,680 miles are going to be great! Good article. Must try one out. Even if you re in excellent shape and very fit, you still can get exercise by e-biking. When I did a head-to-head comparison of commuting with my cross bike versus a recreational e-bike, I found that my relative effort was much lower, and I burned about half as many calories, on the e-bike. But I still burned something up to 200 calories per hour, the equivalent of what you burn by walking. And I opted for quick e-bike rides to town where I would usually drive, which means I was considerably more active overall.